Bible Reference: Judges Chapters 13-16. The well-known judge Samson was from the tribe of Dan; however, few Danites lived in the allocated tribal lands northwest of Judah. Most Danites had moved north to the base of Mount Hermon because they could not seize their allocated land from the Philistines. God sent the angel of the Lord to announce Samson’s birth to his parents. The angel told them that Samson should be a Nazirite (Numbers 6: 1-21). Nazirite means “separated” or “dedicated” and included that Nazirites abstain from any product made from grapes, e.g. wine, raisins. Nazirites could not use a razor on their head or cut their hair; nor could they go near a dead body, animal or human. When Samson was born, the Philistines had been oppressing Israel for 40 years (Judges 13:1). From adulthood until his death, Samson achieved single-handed triumphs over the Philistines. Although Samson was a heroic figure, his personal life was a tragedy. Samson’s downfall was his preference for immoral women. First, Samson married a Philistine woman who betrayed him; this woman was killed by the Philistines. Second, he had a liaison with a prostitute. Finally, he fell in love with Delilah who betrayed him into the hands of the Philistines. Delilah made an agreement with the Philistines that for a large sum of money she would disclose the source of Samson extraordinary strength. After much cajolery, Samson told Delilah that if he was tied with seven fresh, never dried, thongs (braided rope), he would become as weak as other men (Judges 16: 7–9). Accessing seven fresh thongs was a significant challenge. 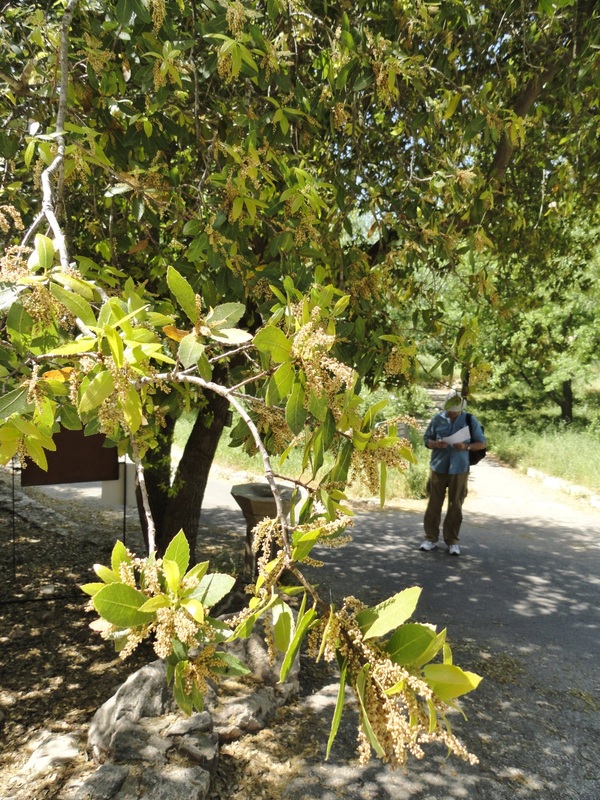 The noted Israeli botanist, Hogah Hareuveni (1989) proposed that the throngs or ropes that Samson identified were made from the Thymelaea hirsute plant, known in Hebrew as yitran. Yitran did not grow in the Valley of Sorek where Delilah lived. Yitran would have been available in local markets; however, it would have been dried not fresh. To make fresh yitran thongs, the Philistines had to cut and bring fresh yitran bark from the Mediterranean Sea coast. Highest quality yitran bark was needed so the thongs would be strong. The yitran had to be smooth, without twigs, so that it could be braided into rope. The book of Judges tells the reader that the Philistines brought Delilah seven thongs and Delilah tied Samson with them. With Philistines hidden in an adjoining room, Delilah called to Samson, “Samson, the Philistines are upon you.” Samson snapped the yitran thongs and killed his attackers so the secret of Samson’s strength was not tied to yitran rope. Eventually, Samson became weary of Delilah’s pleas to tell her the real source of his strength. Samson’s disclosed that his strength lay in his hair. Delilah cut Samson’s hair and the Philistines captured him. They gouged out Samson’s eyes, bound him in bronze shackles and set him to grinding grain in prison. Surprisingly the Philistines did not keep Samson’s head shaved. Over time his hair grew back. When the Philistines assembled to celebrate the delivery of Samson into their hands, they brought Samson to exhibit to the crowds. Samson requested the servant who accompanied him to place him between two main temple pillars. There Samson prayed to God for return of his strength. God heard Samson prayer and gave him the strength to push the two pillars down. The result was that Samson razed the temple by knocking the pillars over. More than 3000 Philistines were killed that day as was Samson. The Thymelaea hirsute (also spelled hirsuta) is known as yitran to Hebrews and as mitran to Arabs. Yitran is a perennial, evergreen shrub that grows profusely in the Mediterranean coastal plan and in the Sinai Peninsula. The yitran’s root penetrates deep into the soil allowing the plant to remain green throughout the year even in desert areas. Older and well watered yitran grows as tall as 6 feet. Branches and stems can spread or trail and whip rapidly in the breeze. Branch configuration gives yitran a bow shape. When yitran branches are rubbed or when the bark is peeled to make ropes, the yitran bush gives off a diffuse sulfurous odor. Stems are densely packed on branches. Yitran branches were and are today braided into a cable-type rope. Ropes are strong enough to haul a full-sized man out of a well, secure a tent during a sandstorm, and yoke camels. When camel yokes are made row-upon-row of twisted inner bark of fresh yitran branches are braided. Philistines would have been aware of the strength of seven braided thongs of yitran; thus, they accepted that binding Samson with freshly braided yitran was a way of defeating his strength. The yitran plant is associated with strength and no Bible character had more physical strength than Samson. From his conception God sat Samson apart to act as a judge over Israel using his physical strength; however, Samson’s behavior suggested that he forgot the origin of his strength. In reality it was not from long hair – many individuals have long hair and they are not necessarily strong. Samson’s physical strength was from God. When Samson placed his love for Delilah over his devotion to God, Samson lost God’s presence and strength. The Psalms recorded that God is the origin of individual strength, e.g., and no warrior escapes by his (own) great strength (Psalms 33:16), God is our strength and shield (Psalm 28:7); the Lord gives strength to his people (Psalm 29:11). God answered Israel’s plea for his attention with this assurance: “Do you not know? Have you not heard? The Lord is the everlasting God, the Creator of the ends of the earth. He will not grow tired and weary, and his understanding no one can fathom. He gives strength to the weary and increases the power of the weak” (Isaiah 40:28–29). When Samson was tired and weak, he asked God to give him strength so that he could destroy the Philistines even if it meant his own death (Judges 16:17-30). This was the first time Samson prayed before he judged the Philistines. It took Samson many years and much heartache before he realized that he must rely not just on his own strength, but on God’s strength. Thought: The Bible never recorded, “God helps those who help themselves.” It’s okay if we rely on God’s strength. In fact He prefers it that way. The episode of Succoth refusing to assist Gideon and his punishment of them is in Judges chapter 8:1-21. God called Gideon to judge Israel when the Midianites and allies invaded the land. The Midianite army was marauders who swarmed across Israel stripping the farm land bare. Gideon was from the tribe of Manasseh which held land on both the east and west side of the Jordan River. Gideon’s home was Ophrah, a town southeast of the hill of Moreh on the west side of the Jordan. Prior to the incident at Succoth, Gideon and 300 men routed a massive force (over 100,000 swordsmen) of Midianites near Morah. The Midianites fled south along the Jordan River. Some crossed the River in the area of Succoth and Peniel near the Jabbok River. Gideon and his 300 men pursued them and came to the town of Succoth, in the tribal lands of Gad. Gideon told the elders of Succoth that he was pursuing two Midian kings, Zebah and Zalmunna, and asked for bread for his worn-out men. The elders of Succoth refused to give Gideon any provisions and were insolent in their refusal saying that Gideon and his men were assuming a victory that was not yet realized. Possibly, the Succoth elders were unsure that Gideon would defeat the Midianite kings. They feared reprisal from the kings. Hearing the Succoth elder’s refusal, Gideon promised that he would tear their flesh with desert thorns and briers when he returned. Gideon and his 300 men routed Zebah and Zalmunna and 15,000 Midianites at Karkor and later captured both of them. Returning from battle, Gideon captured a young man of Succoth and learned the names of the 77 elders of Succoth who refused bread to him and his men. Gideon proceeded to Succoth, took the elders of the town, and punished them with desert thorns and briers. The Bible does not describe how the elders were punished, but historical writers’ claimed that when thorns and briers were used as punishment, men were stripped of clothes. Thorns and briers were placed on both sides of their body; heavy sledges (sleighs) were pressed on thorns and pulled across the body so the skin was severely torn. Considering the Succoth elders refused food to the pursuing Israelites, their punishment would have been severe and probably eagerly applied by the Israelite soldiers. The thorn described in the episode of Gideon and the elders of Succoth is thought to be the Syrian thistle. The Syrian thistle is native to Middle Eastern countries and southern Europe. 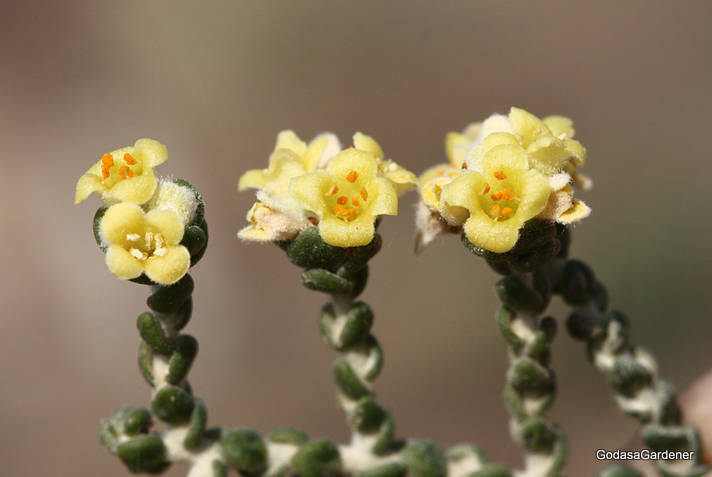 It is an annual plant that belongs to the semi-desert flora. In Israel it grows throughout the entire country including the desert south. The Syrian thistle is often found in disturbed lands, e.g., sides of road and construction sites. Leaf margins or edges are deeply lobed and gray-green in color with white veins. Leaves have sharp spines on both the leaf margins and the apex; at times leaves look more like spines than leaf blades. Israeli researchers suggested that over centuries or millennia, leaves developed into spines as a protection against mammalian grazers. The Syrian thistle symbolized retribution in the episode at Succoth. Retribution is the dispensing or receiving of reward or punishment; or something given or exacted in recompense. Retribution is often confused with revenge, which means to avenge oneself usually by retaliating in kind, e.g., to inflict injury in return for an insult. Although retribution and revenge have many of the same synonyms, e.g., retribution includes the synonyms a reckoning and justice. In the United States we have a judicial system where men and women stand trial for offenses against the civil laws. The purpose of the judicial system is not to exact revenge for persons who were harmed. Rather the judicial system punishes individuals who break the law. Judicial punishment is not revenge, but retribution because it includes justice. I am fairly sure that if Gideon had not taken retribution on the elders of Succoth, God would have repaid them for their fear and selfishness. Jeremiah wrote that God is a God of retribution and that God will repay in full (Jeremiah 51:56). The Old Testament stated that the Israelites were not to seek revenge or bear a grudge against their people (Leviticus 19:18). They were to love their neighbors as they loved themselves. Neighbors included not only Israelites who lived near-by, but those who lived far distances, e.g., Succoth in the territory of Gad. Saint Paul wrote to New Testament Christians not to take revenge on those who persecuted them (Romans 12:14, 19); rather, Christians were to leave room for God’s wrath. We do not know what Gideon was feeling and thinking when he punished the Succoth elders with thorns. Hopefully, he was exacting retribution, not revenge, from the elders of Succoth for refusing to feed his weary, hungry men. There is no record that God was displeased with Gideon’s actions. Reflection. Retribution and revenge are inextricably tied together. Often it is not possible to determine if individuals are exacting retribution or revenge. Ideally, God’s people will followed God advice and let him apply vengeance for what is done against them. Read about Samson in Judges Chapters 13-16. The well-known judge Samson is the final character described in Plants and the Promised Land. Samson was a judge over Israel for 20 years between 1075-1055 B.C. Samson was from the tribe of Dan; however, few Danites lived in the allocated tribal lands northwest of Judah. Most Danites had moved north to the base of Mount Hermon because they could not seize their allocated land from the Philistines. God sent the angel of the Lord to announce Samson’s birth to his parents. The angel told them that Samson should be a Nazirite (Numbers 6: 1-21). Nazirite means “separated” or “dedicated” and included that Nazirites abstain from any product made from grapes, e.g. wine, raisins. Nazirites could not use a razor on their head or cut their hair; nor could they go near a dead body, animal or human. The T. hirsute (also spelled hirsuta) is known as yitran to Hebrews and as mitran to Arabs. 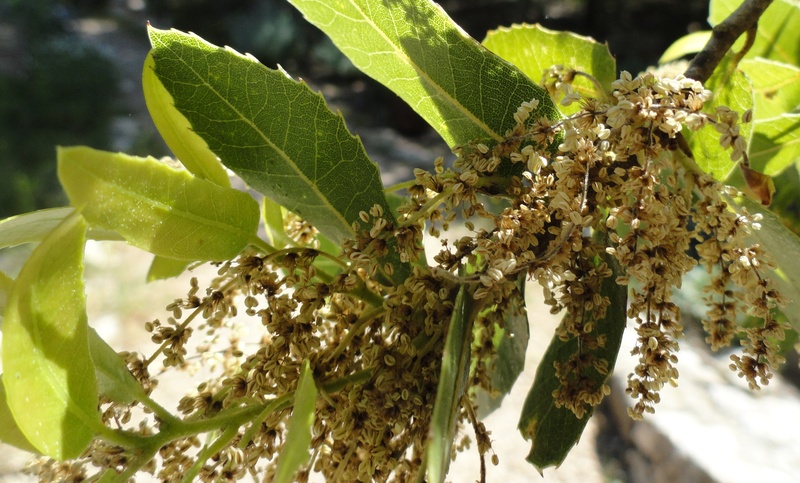 Yitran is a perennial, evergreen shrub that grows profusely in the Mediterranean coastal plan and in the Sinai Peninsula. The yitran’s root penetrates deep into the soil allowing the plant to remain green throughout the year even in desert areas. Older and well watered yitran grows as tall as 6 feet. Branches and stems can spread or trail and whip rapidly in the breeze (Hareuveni, 1989). Branch configuration gives yitran a bow shape. When yitran branches are rubbed or when the bark is peeled to make ropes, the yitran bush gives off a diffuse sulfurous odor. Stems are densely packed on branches. Yitran branches were and are today braided into a cable-type rope. Ropes are strong enough to haul a full-sized man out of a well, secure a tent during a sandstorm, and yoke camels. When camel yokes are made row-upon-row of twisted inner bark of fresh yitran branches are braided. Philistines would have been aware of the strength of seven braided thongs of yitran; thus, they accepted that binding Samson with freshly braided yitran was a way of defeating his strength. Reflection: The Bible never recorded, “God helps those who help themselves.” It’s okay if we rely on God’s strength. In fact He prefers it that way. Copyright July 25, 2011; Carolyn A. Roth; all rights reserved.